Customise your white-label payment experience from start to finish! Focus on your user journey while we take care of the payments. Integrate our technology seamlessly in your web and mobile app. All of our functionalities are white-labelled, automated, and delivered through our API. 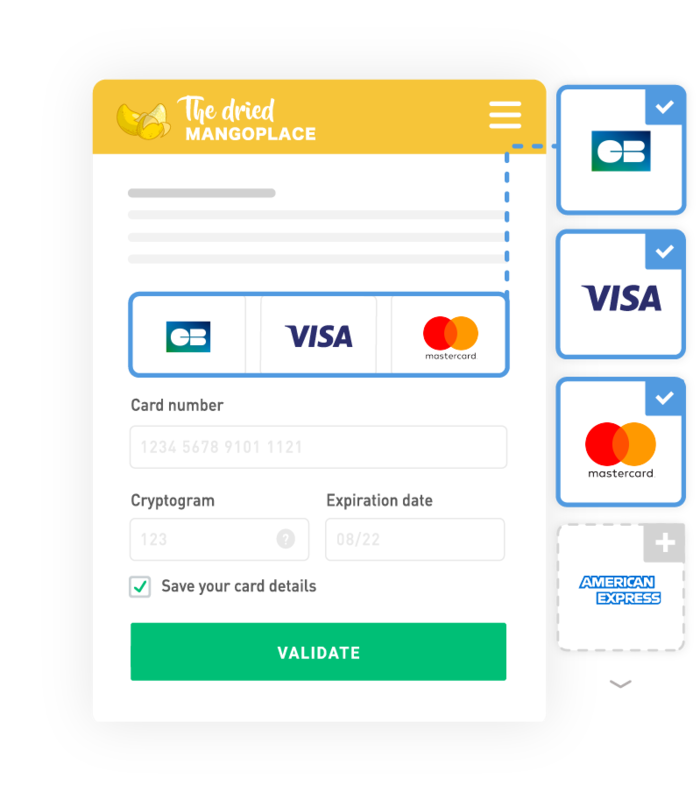 Fully integrate the payment page into your design for maximum adaptability or choose a swift and efficient solution with our customisable template. Design and integrate your payment page from scratch or take advantage of our customisable template. Select the local and international payment methods which best suit your product and audience. Make use of our card registration kits included in our SDKs to easily integrate payments on any medium. Include one-click or recurring payments on your payment page. Our tokenization technology ensures the safe handling of card data. Integrate our API calls to safely and automatically send us your users' required identity verification documents. Allow your users to check and manage their accounts within your environment. Add a transaction descriptor to your end-users' bank statements for full transparency. Which payment methods does MANGOPAY support? Please find below the currencies accepted by MANGOPAY. A user can pay with another currency if the issuing bank agrees to convert the money internally. How do I receive my fees?